Nearly four dozen GOP members are leaving at the end of the session (or even earlier). But many aren't waiting until then to start speaking their minds. 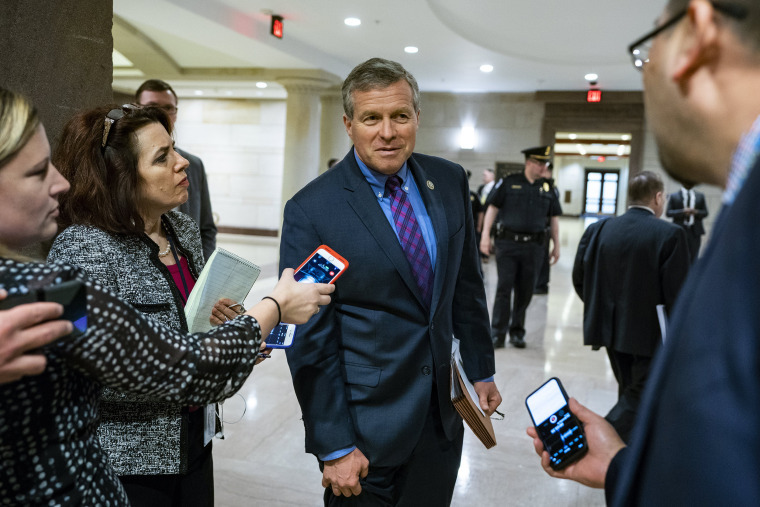 WASHINGTON — Earlier this month, Rep. Charlie Dent of Pennsylvania became the first House Republican to formally back legislation to protect special counsel Robert Mueller's job, co-sponsoring a bipartisan bill. Less than a week later, he announced he was beginning his retirement from Congress months earlier than expected: Instead of leaving at the end of the session, he'd head for the exit in May. The move may have seemed sudden but the seven-term congressman, who had initially announced plans to retire last September, has spent much of the past year eyeing the door — and speaking his mind. Since announcing his retirement, he has denounced President Donald Trump and been critical of Republican leaders. He told MSNBC last week that he's leaving Capitol Hill "in part due to frustration," naming the president as one factor. "Sure, the president is a reason," he said. "Let's face it, it's a pretty toxic environment for my party right now," Dent said. Dent is among the nearly four dozen Republicans in the House and Senate this year who have resigned from Congress, plan to retire or are running for another office. And so without the usual filters, says GOP strategist Rick Wilson — fear of a primary challenge, fear of upsetting the Republican base, "fear of mean tweets" from Trump himself — more than a few have decided to toss the talking points. "I think they definitely feel liberated now," Wilson said of departing Republicans. "The only thing that they see right now is that they're going to get the hell out of Washington. They're going to escape this sh--show." In late January, Rep. Trey Gowdy, R-S.C., shocked Washington with his decision to retire from the House, seven years after he arrived to Congress with the tea party wave. Since his announcement, the former chairman of the Select Committee on Benghazi has veered notably off-script. Two weeks after announcing his retirement, Gowdy — the chairman of the House Oversight and Government Reform Committee — announced that he was launching an investigation into Rob Porter's employment and security clearance status at the White House despite domestic abuse allegations. In March, Gowdy split from fellow Republicans on the House Intelligence Committee and contradicted their findings in their Russia investigation, saying it was "clear, based on the evidence, Russia had disdain for Secretary Clinton and was motivated in whole or in part by a desire to harm her candidacy or undermine her presidency had she prevailed." "No, I don't like the job," Gowdy said candidly about serving in Congress in an interview this month with VICE News — adding that he was actually counting down the number of drives he has to take to the airport until he can flee Capitol Hill for good. Some departing members have been critical of Republican leaders at one end of Pennsylvania Avenue or the other. Others have been more circumspect. Sen. Bob Corker, R-Tenn., has been both. Corker first announced last September that he would not seek re-election. The next month, he set Twitter ablaze when he responded to an attack by Trump with the reply "Same untruths from an utterly untruthful president" and the hashtag "#AlertTheDaycareStaff". The Tennessee senator then re-considered retirement, before deciding in February that he'd made the right call the first time around. Within weeks, he was publicly praising Democrat Phil Bredesen, who's running for his seat: "I think he's got real appeal." "He was a very good mayor, a very good governor, a very good business person," said Corker. A few days later, he offered a tepid endorsement of the GOP candidate, Rep. Marsha Blackburn, in a a CNN interview. Some of the graduating class of 2018 have even taken their intra-party critiques to the floor. Sen. Jeff Flake, R-Ariz., who announced last October that he would retire from Congress after serving only one term, has since delivered multiple speeches excoriating the president — including one the day he announced his departure. "Reckless, outrageous and undignified behavior has become excused and countenanced as 'telling it like it is,' when it is actually just reckless, outrageous and undignified," Flake said on the Senate floor. Flake has not ruled out challenging Trump for the GOP nomination in 2020, and in February voted against a White House-backed immigration proposal and voted for a bipartisan immigration proposal opposed by Trump. In a speech at the National Press Club in March, Flake said his party "might not deserve to lead." A day after three-term Rep. Ryan Costello, R-Pa., revealed his plan to retire from the House, he said that President Barack Obama had been a role model for the nation — but his successor has not. "When the question was asked during the presidential race, if someone had asked me, is he a role model? I would have said no," Costello said in an interview on MSNBC. "I disagreed with many of President Barack Obama's policies. There were some I agreed with, but I disagreed with many of them. But he was a good role model. He conducted himself in an appropriate way." Other exiting Republicans have become outspoken critics of key administration officials. Rep. Frank LoBiondo, R-N.J., who has served in Congress since 1995 and is retiring at the end of the year, became the fourth House Republican this week to call on EPA Administrator Scott Pruitt to resign, tweeting that he was the "wrong fit from [the] start for [an] agency dedicated to protecting our environment." In December, LoBiondo was among 12 Republicans who defected and voted against the GOP tax bill that Trump signed into law. LoBiondo and other retiring Republicans "don't have to worry about what anybody else thinks," said former Rep. Tom Davis, R-Va., once chairman of the National Republican Congressional Committee. "They're free from any kind of repercussions from their voters who may disagree with them. But number two, and this is equally important, a lot of them are looking at, what's my afterlife going to be." Davis, who now serves as the director of federal government affairs for Deloitte, said that the president is not popular among many interest groups, and suggested that coming out against him or his policies could make them "more marketable." But if that future path is a political one, the calculus of congressional candor might be a bit different. Former Rep. David Jolly, R-Fla., who called on the House floor in December 2015 for Trump to drop out of the presidential race, acknowledged more members are speaking out, but added that some are "keeping their powder dry" because they could return to Congress someday. "One retiring member told me, 'Look, perhaps I still could have run in November,' but the only way to do that as a Republican was to stick with Trump.' He didn't want his career to be defined as a Trump Republican," Jolly said. "He said, better for him to retire without the label and then perhaps come back in four or six years." CORRECTION (April 28, 2018, 4:15 p.m. ET): A previous version of this article misstated the state U.S. Rep. Frank LoBiondo represents. It is New Jersey, not Pennsylvania.